The St Lawrence Seaway is a magnificent engineering accomplishment that opens the furthest ports of the Great Lakes to the Atlantic Ocean and thence to the rest of the world. At 2,340 mi/3,700 km, it reaches right into the heart of North America. Technically, the St Lawrence Seaway refers to the waterway from Montreal PQ to Port Colbourne ON at the east end of Lake Erie. 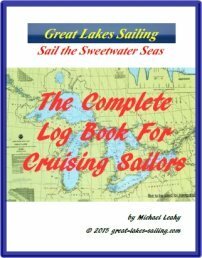 However, sailors see its tracks on every lake as we chart our courses and with the sighting of every great cargo ship slipping past.The Montreal to Lake Ontario section has 7 locks, the Welland Canal has 8 and Sault Sainte Marie has 4. The St Lawrence Seaway we see today is the result of 50 years of discussions, negotiations and planning between Canada and the United States. But, for some 400 years prior, it was a dream that stretches back to Jacques Cartier in the very early days of the 1600's. Over the centuries, canals were dug in various places (Lachine in the early 1700's and Welland in 1803) but there was no coordinated effort. As both countries expanded westward, the economic usefulness and need for a passage to Lake Superior continued to grow. In 1895, the Canadian and U.S. Governments established a commission to study the feasibility of a joint waterway. In 1909, the International Joint Commission was established. Studies and negotiations continued until the early 1950's when the first shovel went into the ground in 1954. In June 1959, the St Lawrence Seaway was officially opened. 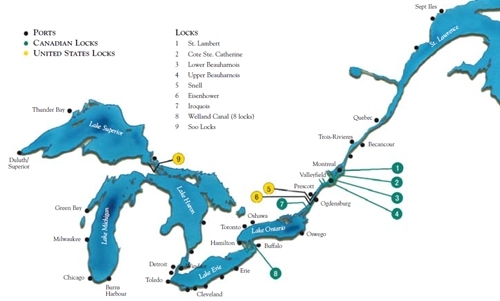 For Great Lakes sailors, the locks that matter are the ones in the Welland Canal and the Soo locks at Sault Sainte Marie. These two sets of locks open up the entire Great Lakes to an adventurous sailor. Journey through these and prepare for another level of sailing pleasure, exploration and discovery. Click here to visit the St Lawrence Seaway official website. Click here to see a map of ships transiting the Seaway.